Business Intelligence (or BI) is a hot topic in the business world these days. Although it doesn’t gain quite the number of headlines that blockchain and the Internet of Things do, it isn’t because of a lack of importance. In fact, depending on your organization, Bi might be far more relevant, and certainly more immediately important to you. Many businesses still aren’t clear on what business intelligence is, or how it can help them. Yet it’s more important to businesses of all sizes in 2018 than it has ever been before. The first step in understanding why business intelligence is so important to businesses today starts by understanding what it is (and what it isn’t) and its origins. BI is a term that’s used pretty loosely across both business and IT departments. What it’s largely understood to be, however, is the tools and technologies that help businesses make data-driven decisions. The technology that stores the data, the code that acts on the data to make it understandable, and the tools that allow the data to be viewed by technical and business audiences alike with clear graphical visualizations are all part of business intelligence. The analysis of this data frequently falls under the term business intelligence as well. Business analytics is the processing of the data into a form that helps businesses make smart decisions. Processes like predictive, descriptive, and streaming analytics all provide views of the information that the BI tools store and make available. Technology isn’t required for business intelligence, however, despite the term being primarily applied today to tech tools. In fact, the phrase was initially coined in 1865 by Richard Millar Devens in discussing a contemporary’s use of data to guide his banking business, profiting on customer trends before competitors could do so. At its very core, that is what BI is. It’s using information that an organization has, or has access to, to make informed planning decisions to give them an edge on their competition. Since computers got involved, BI has taken leaps forward, but in the early days of technology-based business intelligence, things were complicated. Systems were siloed and it took specialized skills and knowledge sets, and a lot of time, to pull meaningful insights from the information. Technology evolved, allowing companies to store an increasing amount of data, process it faster, and make it available across more systems. Business intelligence and connecting data sources across the business was the driving force behind the creation of relational databases. Technology has continued to change to accommodate massive amounts of data useful to companies. As the amount of data has increased, so has the ease of use of the tools. How is BI different today? Business intelligence has changed drastically over the past decade. Thanks to new database tools, companies can now store more data than ever before and use that data in meaningful ways. Development tools have made it easier to create data views for analysts to correlate information across business units quickly so that decisions can be made at the speed of today’s business world. While these tools still require technical resources, the time can be spent in automating data processing instead of manually pulling data from multiple sources and developing the reports from scratch. In addition to that, another key change in BI as we know it today is the concept of real-time data vs snapshot data. When you build a report manually, that report becomes outdated the minute you print it out and because of this fact, in order to keep relatively up to date business reports, there are a large number of continuous man hours required just to pull data and generate reports. With BI, a technical implementation team can set up the system integration, data plumbing and reporting interfaces up front and the business users can view and pull in real-time reports 24/7/365 to gain real-time insights into their organization with data that is never stale. This ability gives a company the clear advantage over the legacy competition that does not have access to real-time insights. Data is also no longer limited to what you have been able to gather from your own company. Data streams can be purchased and integrated into company data to give a complete picture of any given area, from customer profiles and habits to manufacturing and supply chain predictions. It’s not just about measuring and then beating your own benchmarks as an organization. It’s more important to see how you measure up in your industry and how you can improve upon the status quo to rise up as an industry leader. The tools to manage all this data are what makes business intelligence easier and more accessible to a wider range of businesses. What Tools are Important to Business Intelligence in 2018? The tech tools that are available today for business intelligence and analysis is what makes 2018 so different from the BI of the past. Data warehouses house huge amounts of information together in a single place and SaaS integration tools make it possible to pipe data across multiple systems in real time. Unlike in the past, where data was siloed into individual systems, a data warehouse pulls disparate data together for review and analysis. Another fairly recent tool (at least relative to business intelligence as a whole) is Big Data. These data sets are large and complex, creating the need for specialized storage and new ways of retrieving the information. For instance, a company in 2018 can take their customer data – a large amount of information, but not massive – and put it together with data mined from social media. These two components together can help inform a company what customer sentiments are while indicating potential purchasing trends, helping digital marketing efforts, product decisions, and refining release schedules. Cloud computing is an enabler of large data storage and analysis. Platforms like AWS and Azure have made storage flexible and affordable for companies, opening up BI to more than enterprise-sized organizations. Probably one of the most important advancements for businesses is the development of rapidly created dashboards. Dashboards provide graphic representations of data so that decision-makers and executives can rapidly grasp the insights that the data is trying to convey. Dashboards allow non-IT business resources to drill down into the information presented in graphs and charts to gain a deeper understanding of the driving forces of the business as well a the industry. 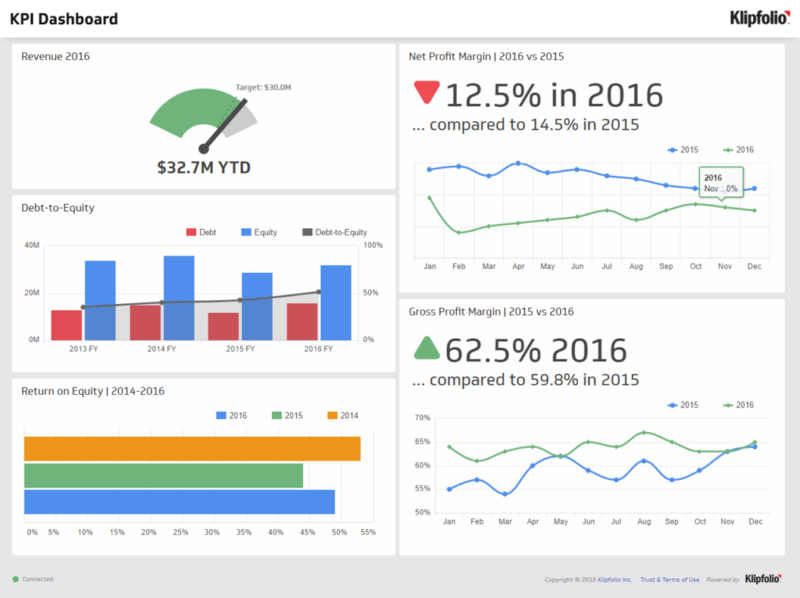 Plus, dashboards are easier than ever to create, with cloud-based tools like Klipfolio available with existing integrations to multiple potential data sources. Thanks to all of the advancements in BI and the tools sets that allow data analysis to occur, business intelligence is available to nearly every business no matter how big or small. In fact, studies have shown that even small businesses benefit significantly from business intelligence. In particular, cloud-based SaaS applications make bringing together data and analyzing it easier and more cost effective than at any time before. Small businesses without IT departments can quickly set up dashboards using the data from their existing applications to better understand their customers, their finances, and their path to growth. In 2018, the real truth of business intelligence is that you must consider using it because of its availability and increasing simplicity. Even if you don’t make the investment in it, it’s likely that your competitors will. Do you need help understanding how to use BI at your organization? We're happy to share our expertise! If you have questions about how your organization can leverage your data or industry data to improve finances, operations, profitability or a number of other KPI's (Key Performance Indicators), we certainly have answers to those questions!